So, you have the “opportunity” to plan the company holiday party. Great news! Right? Often, the HR department or the administrative team is tasked with putting this event together. Sometimes you even get a committee – hooray! Even if you enjoy event planning, it’s rare that the rest of the regular workload is lightened for the people taking this on. And, trying to find something to make everyone in the office happy is next to impossible but that probably won’t keep you from being stressed about it. Food. Does your venue have a built in caterer or do you need to hire one? Dinner, appetizers (passed or stationed? ), dessert, etc. Consider the atmosphere you want as well as the time and duration of the party to help you determine your meal. Don’t forget to provide for vegetarian options. If you can gather dietary preferences of your co-workers and accommodate those, even better. Beverages. For an office party – you probably want an open bar you’re going to serve alcohol. If it’s a cost or risk management issue, consider providing the first two drinks for everyone. Another way to keep costs low is to limit it to beer and wine. You’ll need your non-alcoholic beverages and mixers for liquor as well. Consider how alcohol will be served if it’s not built in to your venue or caterer. And, have a few cab numbers readily available. Entertainment. Again, this is dictated by the style of party you want. DJs and live music are great. Or for a more interactive twist, consider a dueling pianos show. And you can always use speakers and an iPod for simple background music (here’s a playlist to get you started). Other activities like a gift exchange, scavenger hunts or holiday inspired games are always an option too. Speakers/Presentations. With a company party, it’s likely that someone will want to say a few words. Besides planning the program and timing; make sure you have the right A/V equipment and a stage if needed. (And, on behalf of your co-workers – keep it short. People don’t want to listen for more than 15-20 minutes max). Budget. The bottom line. Enough said. If you get these things covered, you’ll be in great shape. And don’t forget to enjoy the party after all of your hard work! If you want something a little more turnkey – our friends at InnovativEvents provide a great option. Illuminate is an all-inclusive, ready-made celebration. Everything is built in to one fabulous night with some options to make it the best fit for your company. On top of all this – the production is top-notch (like anything else from InnovativEvents) so everything looks as amazing as your experience will be. All you will need to do is pick your package, choose any add-ons and enjoy! As always, Socialize is available to help. Contact us to find out what we can do to help in your planning process. Whether it’s a basic consultation to create a detailed plan and give you vendor recommendations or taking it off your mind and coordinate it all. So things have been pretty busy in Socialize-Land. There have been some exciting developments and weeks that proved a little more than stressful. But all-in-all things have been enjoyable. The BIG news is that I took Socialize full time in October! When I first got started back in October of 2010, I had a part-time job (read: safety net) planning events for a local non-profit. It was great but wasn’t really leaving me much time for developing my business. Then, in August of 2011, a friend recommended me for a contract job to plan a large conference. After a few meetings, I landed it! The project requires 20 hours a week for six months (part in their offices and part from home – yay!). So in October, I left my part-time job and started working only under Socialize! The project will end in April/May so keep your fingers crossed that there is enough to keep me busy after that. In the meantime, I’ve worked with some wonderful brides, put on several corporate events and meetings, helped with a baptism celebration and even did a “Get the Party Started” package. My sister is getting married in May so there’s been a lot of fun planning that with her. And there’s plenty more in the works for 2012! Well hello there! Yes, Socialize is still alive and doing well! As you might have guessed, it’s been keeping me busy. But more to come on what’s been going on in my little event planning world. But today, you just need to check out a Des Moines Register online article where I’m quoted (on behalf of Socialize) on how Pinterest is helping brides to plan their weddings. You’ve heard of Pinterest, right? In case you need more inspiration – you can check out my boards here. It’s a blog post! Let’s pop open a bottle and celebrate! Actually, this post had been started previously but I hesitated to put it out there. You see, I’m a wannabe wine connoisseur but have only a very basic knowledge. But I do know enough to see that champagne and sparkling wines are not just for special occasions these days! Which is great – because what else has the ability to kick festivities up a notch so easily? So I’m drawing on the actual oenophiles for this but wanted to share some fun facts and quick tips about the bubbly. Now, to use! Part of what has contributed to the growing popularity of champagne and sparkling wines is the acceptance of it as an anytime drink. Have it before, during or after a meal. Or, just have a glass on it’s own. Yum! Then you’ll want to open the bottle and serve in a coup, flute or tulip-shaped glass. The styles all have reasons behind their design but unless you’re entertaining a sommelier, feel free to pick based on aesthetics or what you have on hand. You can make things a little more interesting by adding a champagne bar. Have assorted juices available (orange, pomegranate, grapefruit, etc.) and sugar cubes soaked in bitters so guests can make their own creations. Or give them some guidance with champagne cocktail ideas like these from the Food Network. Finally, decide what you’re going to toast to. Cheers! Note: Most of my information is highlights from this post by Rick Bakas. If you want more information and a full price range of recommendations; check out the full text – it’s informative and easy to understand! Yes, it was one month ago that I posted about planning my 30th birthday bash. Oops. Why don’t we just get down to business? First off – the invitation unveiling. I had a lot of fun “designing” these. Please note that for me – designing means slapping together some fonts and images in Photoshop. Illustrator and creating my own images scares me. So a little printing and some DIYing later and this is (kind of) how the Dirty 30 Debutante Ball looked. You’ll have to excuse the quality of my camera and photography skills. I realized a little too late that I didn’t have a picture of the whole scene or good shots of the tables. Live and learn. I admittedly have an obsession with photos booths and couldn’t let this party go without one, with plenty of fun props! As in the invitations, disco balls made up a central part of the decorations. You can’t tell from the yes-I-really-need-a-new-camera-photos but there were LED lights in the vases that held the disco balls. One last bit of inspiration was to have “classy” quotes on the tables. 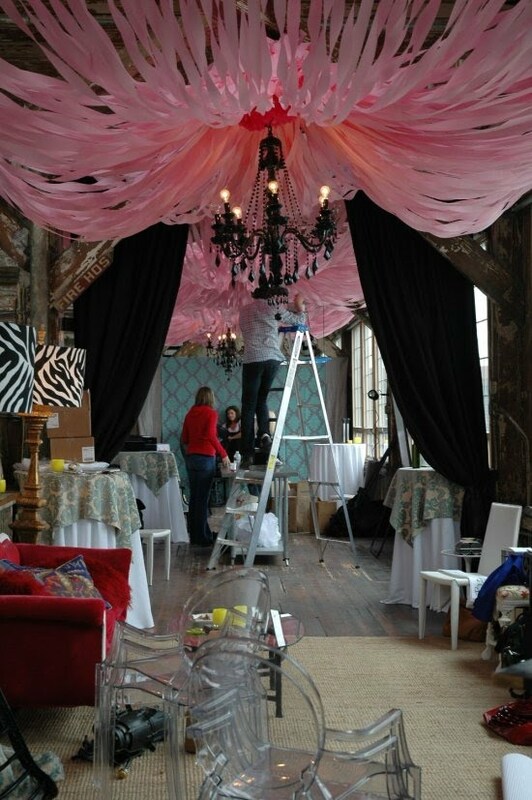 The ceilings in the venue were very high with exposed duct work so I wanted some elements to help tie that in. Some tall vases and DIY metallic fringe chandeliers helped to accomplish that. To top it all off, my sister and one of my best friends surprised me with a lovely creation from Della Dulce Bakery. Um, wow. The inspiration came from one of my very own posts! One where I actually had the nerve to ask for this cake. My friends know how to deliver. With all the fun I had planning the party, the actual night was a great celebration with my friends and family. I am truly lucky to have such wonderful people in my life. Thank you to all who came and to those who were there in spirit! It seems like just yesterday I was posting about the invitations I created for my thirtieth birthday party. And now, The Dirty Thirty Debutante Ball is on Saturday! There’s plenty to do between now and then – including cleaning my house for our overnight guests! So I’ll leave you with an inspiration board to give you an idea of what I think a Dirty Thirty Debutante Ball looks like. Keep in mind that some of these photos come from fabulous parties that I don’t have the budget or set-up time to re-create. So while I won’t be able to accomplish things to their scale, it’s the feel I want to create. Should be fun for all! I have a confession to make…I am a complete and utter Gleek. I love the show Glee. Love it. I don’t think I’ve ever been so excited about a show since Saved by the Bell (I used to hope that they would randomly discover me and put me in a guest role on the show. Yes, now I hope that about Glee). 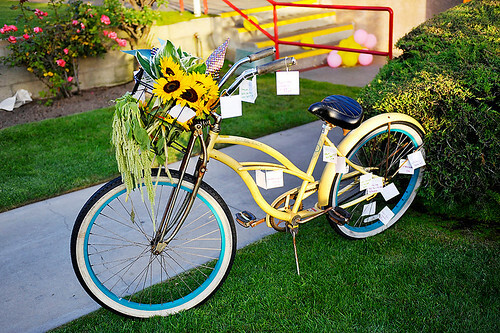 Would you consider doing something like this for your wedding? OK, probably not unless everyone in your wedding party is actually in glee club. But it does portray an important point. Weddings are a joyous occasion. 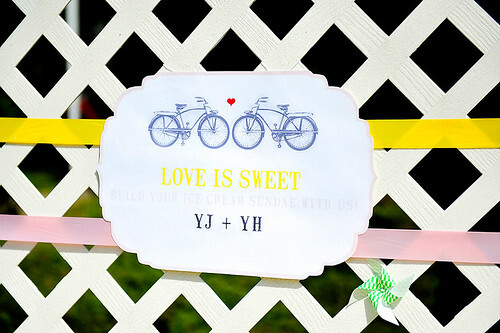 Even if it’s a very formal wedding – you are still celebrating love and life. If you’re planning a wedding, don’t forget give some thought to how you can incorporate some elements to express the happiness of the event. You may not have people dancing down the aisle but why not make them feel like they want to? At the very least – this is a great video to send to your wedding party and tell them they’ll be re-enacting it! Since a good part of the country is buried under snow today, how about a reminder that summer will (eventually) be back? Or will that just be rubbing it in? Don’t you feel warmer already? If you really look at the materials that were used, you’ll see that things were created fairly inexpensively for the event but still created a creative and cohesive theme. 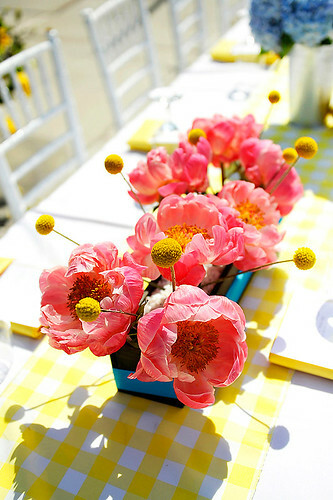 Of course, the flowers weren’t cheap, but notice how large blooms were used in concentrated groupings – that will give you a lot of impact for your money. For more information from the wedding designer and planner who put this together, grab another cup of hot cocoa, curl up and click here. Today and tomorrow (and maybe for a few days after that), a large swath of the country is going to be dealing with a monstrous snowstorm. Even Dallas, Texas is under a freeze warning! For many of us, winter is just another part of the year. There is always a possibility that the weather will cancel your plans. This presents some inconvenience when you’re calling off a committee meeting, a class or a networking event. 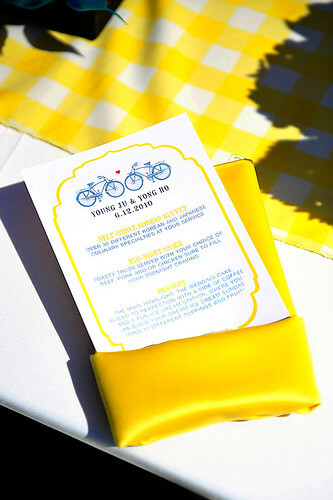 But what if it’s something with a significant investment involved – whether on your part or that of your guests? For most people, calling off an event isn’t going to cause too much pain. There will be some rescheduling, you may face a loss of a vendor deposit, etc. But before any of this happens, you should still have a plan in place if you need to make the call. 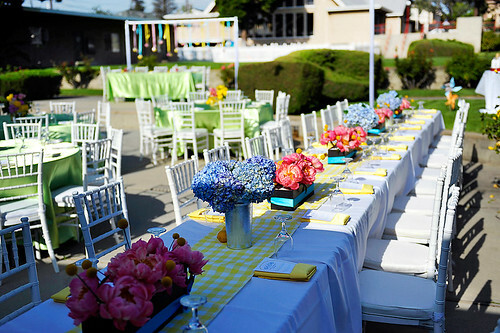 -First and foremost, determine the definite reasons for calling off the event. Natural disasters are an obvious one, but it may get a little fuzzy after that. When does it go beyond what your contigency plan can handle? How icy do the roads have to be before you cancel? If a thunderstorm is predicted during an outdoor event; do you call it off completely or just have everyone take cover if lightning presents? If your keynote speaker falls ill but all other presenters can make it, do you proceed? These things need to be considered. You can’t account for every possibility but making some of these decisions will guide you for whatever may come up. – The next thing you need to know is how you will communicate a cancellation to your attendees. Will it be personal calls, emails? Call the local TV and radio stations so they can include it in announcements if necessary. It never hurts to make your cancellation policies public knowledge either. Sidenote: This is also another reason why I am a huge advocate for creating registration systems or asking guests to RSVP. It’s so much easier to target your audience if you know who is coming and you have their contact information! -Don’t forget your vendors! Always check cancellation policies on contracts and be aware of the costs you may incur with a late cancellation. If you are considering calling things off, let your vendors know so if they are able, they can hold off on preparations and deliveries. If you’re holding an event that is supposed to generate income – like fundraisers, festivals, conventions, concerts, tournaments – you should definitely have event cancellation insurance. Of course, these things are generally major undertaking so I’m likely preaching to the pros on this one. The main thing to remember is that an important part of planning is planning on your event not happening. 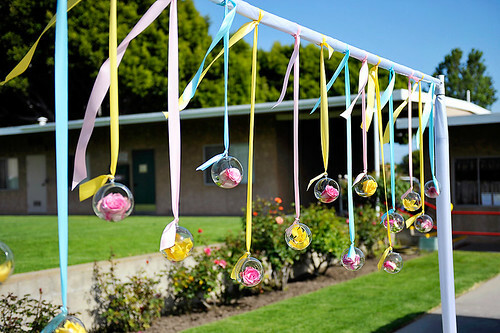 Even if you’re planning a baby shower for 20 – consider a cancellation plan. It will be much easier to tell the mommy-to-be (or other guest of honor) that the party is off if she knows in advance, the conditions for canceling. It is not the most fun part of planning but it will serve you better than blind hope and keeping your fingers crossed!